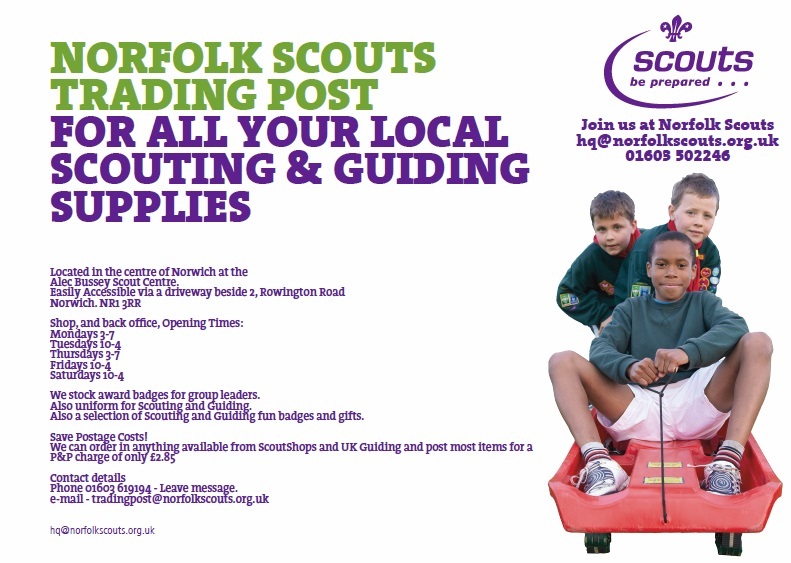 The Trading Post is your local Uniform shop in Norwich, supplying you with Scout & Guide uniforms, scarves, badges, books, blankets and much more! If we don’t have what you’re looking for in stock, we will order it for you and can supply anything available from Scout Shops and Girlguiding UK. It’s always best to try on uniform if you can, but you can’t get in to visit our shop, we can post your order directly to you, wherever you are for usually only £3.00 We can take a card payment over the phone and post out your order the next day. We issue loyalty vouchers for each £10 spent which parents should hand in to their group/unit leaders to be redeemed at the end of the year. This means all profits from sales at The Trading Post go directly back to local Scouting and Guiding. We are located at the Alec Bussey Scout Centre a few minutes walk from Norwich city centre. Find us down the small driveway next to number 2 Rowington Road, Norwich, NR1 3RR. Free short term parking is available on site for customer during opening hours. Remember there are only staff available to respond when the shop is open as shown above. When contacting us always provide name, a contact number and (if you’re a volunteer) group/unit. Alternatively give us a ring on 01603 619194. Use the answerphone if necessary. Please leave a short message and repeat your contact number. See the latest news on offers, opening hours and more!